“IMAGINE hormones racing around in the brain – a perfect storm,” a voice-over intoned. 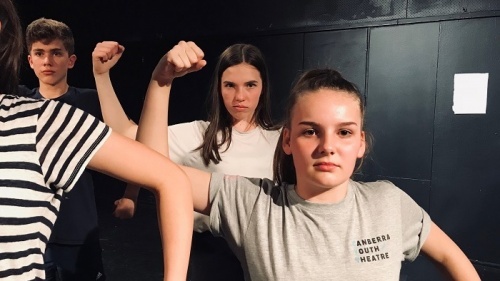 That was the premise for Canberra Youth Theatre’s newest production, an intense, tightly schooled physical exploration of the inner minds of young people on the verge of adulthood. Self-identified as variously 14, 15, 16 and 17, the large ensemble of players, clad simply in shirts and shorts, were presented to the audience as trainee debutantes preparing for a “ball” from which they could not opt out— adult life, presumably. As the tightly-drilled “debs” went through their motions, there was none of the teenage joy that country audience members might recognise as part of being a debutante. On the contrary, the young people reacted like automata as the voice of Big Brother (or in this case Big Sister) disciplined them – no touching, no smiling no talking. 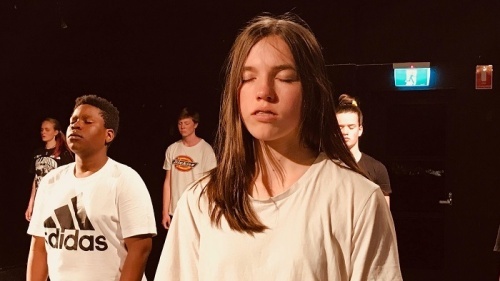 “Between 13 and 18 years… the brain goes into intensive labour mode,” Canberra Youth Theatre tells the audience, accounting for the highly internalised nature of this short piece – perhaps half an hour at maximum. The east courtyard of Gorman Arts Centre proved an exquisite location for this exercise. Backed by perfumed wisteria in full bloom, a sky that seemingly lit up and a half-moon above, nature was enhanced with sophisticated side-lighting to show off the actors’ bodily movements and strip fluorescent lighting to light up their faces. While the piece was book-ended by the ritual of debutante training, couples going in two by two, there were several different gambits played out. Part of the ensemble broke away to hide behind iPad screens showing the audience an idealised, floral-wreathed female face. Here the players attempted to match their bodies to the face, reacting as many young people do, to a stereotype. Others in the ensemble poured shining buckets of water into a wading pool dipping their hands and splashing. The centre of “Faster” was the sequence that began with the entire ensemble stood, backs to the audience, as if in the act of male urination, one by one turning to portray masculine stereotypes. One young man demonstrated the difficulty of crying; another taunted his fellow with the little finger used in imaginative ways; all adopted the masculine stances of sporting heroes, with legs askew and muscles rippling, meeting to form a football scrum. There were very few feminine equivalents to this, apart from a solo outbreak in which a young woman attempted to explain the need to have a boyfriend. The performance came to a frenzied climax as the ensemble members, perhaps showing “what happens to us biologically that is outside of our control”, daubed paint on white “walls” later tearing them down and painting each other, before returning to the tight, restrained, debutante mode.